We love karaoke at the Alibi, but why not ramp up the exotica? 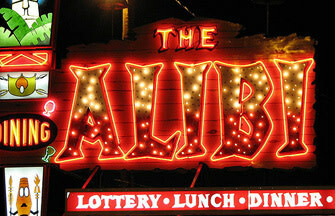 Man, there was no sign of a faltering economy at the Alibi on Saturday night. Between the karaoke crew, at least three birthday parties (happy birthday Jane! ), and the usual assortment of post-collegiate riff raff, there wasn’t room to toss a cookie. I love the Alibi. True, I have griped in print about their propensity for weak, pricey drinks, but for that good ol’ Trader Vic’s vibe, you can’t beat this room. Order a Banana Cabana and take in the day-glo Polynesian art, saltwater aquarium, and assorted surfside knickknacks, and experience some much-needed continental drift away from a dismal present. What I don’t understand, considering all the awesome tiki bar accoutrements, is why management doesn’t go all in with the island theme. How come the waitresses aren’t decked out in sarongs or grass skirts? Why aren’t the bartenders wearing beach attire or at least loud Hawaiian shirts? Karaoke is all well and good, but the room could be put to better use. Couldn’t we have a Don Ho tribute act once in a while? A hula contest? The occasional surf band? It’s certainly considerate that they put out free food at midnight. Nothing soaks up a surfeit of rum like Swedish meatballs and chicken wings. Is it too much to ask for a side of fruit salad? Pineapple is super-sweet and succulent at the moment. I don’t mean to sound ungrateful and I’m not expecting a luau every night of the week. But the average boring, nondescript bar would kill for this setup, not mention the vintage neon out front that’s visible from space. So I move that we double down on the tropical concept. What say you, drinking buddies?